I was inspired by Lia Chen of Bentolicious (http://www.mybentolicious.com/) onigiri post yesterday and the day before. 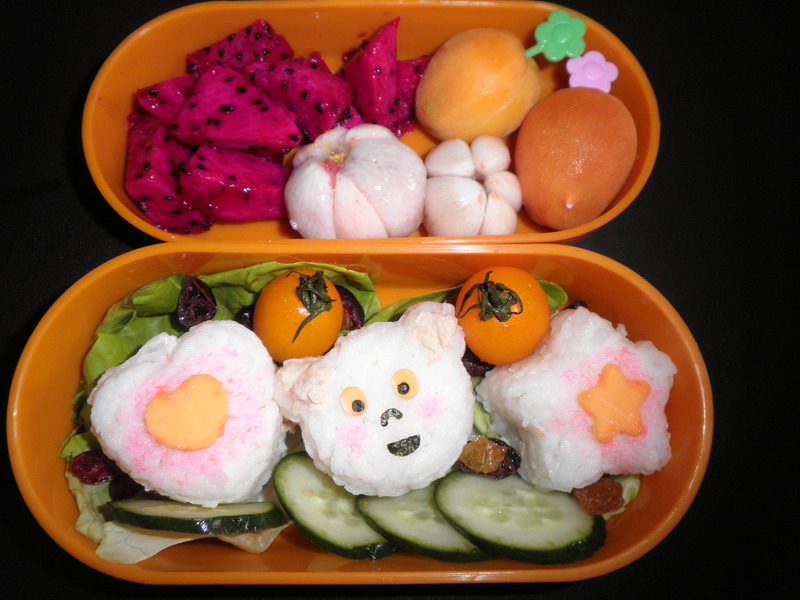 Love her ideas and all her creativitiy in bento making. Don’t know when I’ll be able to get to her master level! Anyway, I tweet-ed yesterday that if I can wake up early this morning I shall try my hands on making onigiri. 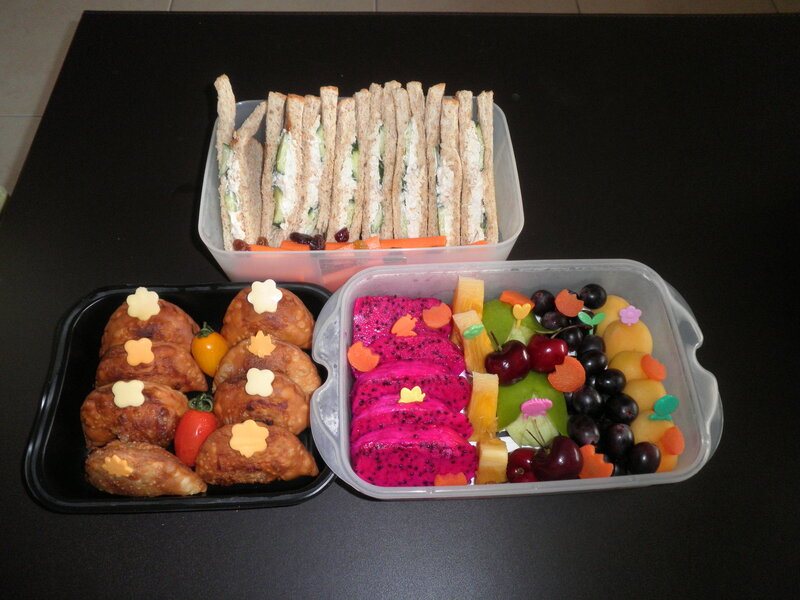 And surely enough, I woke up early and made these bentos. One for hubs and one for myself, of course! I cooked the rice the night before because I was afraid that if I cook it this morning it will be too hot to handle. I used a three shaped onigiri tool that I bought from Daiso (http://www.daiso-sangyo.co.jp/english/). There’s the heart, teddy bear and star shape. 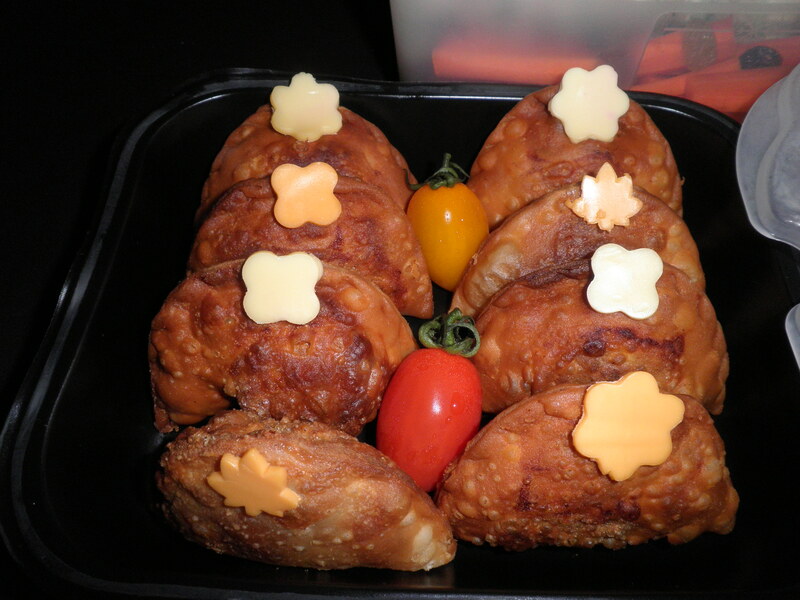 I filled the onigiri with tuna mayo and decorated with cheese, nori and some dashes of sakura denbu for colour. I actually tried making some crabby sausages with the cutter too but the effect was not there. This is the 2nd time I tried using the cutter and still failed to get the crab. Sigh. Don’t know if it’s because I boiled the sausages and didn’t pan fry it. Looked at mine and looked at Lia’s, mine is still far from perfect like hers. Sigh. But once again, I shall continue to persevere!!! Since I know I may not be making bento that often this week, I made 4 this morning!! Made two little bentos, one for my daughter and another for my nephew. My nephew is a great supporter, eating everything in the bento box but my daughter being the pickier one took out almost the entire content and ate only the sandwich. Sigh…Hope she’ll learn to add eat a little bit more varieties especially greens. 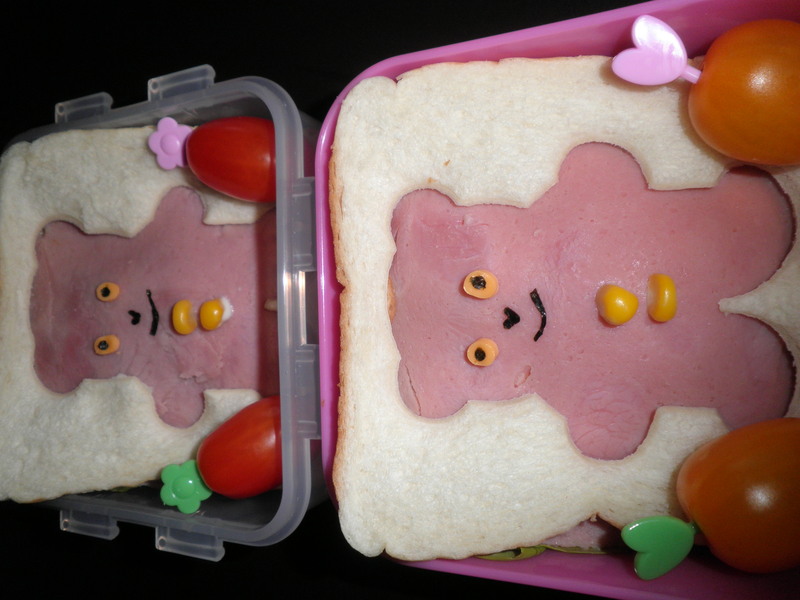 Here are their bentos consisting of a cheese top sandwich cut into a bear and a duck each, tiny tomato for my nephew coz he just loves them, a sugar apricot for my daughter, and ham rolled sausages top with a star carrot and some corns. Oh and a little reddish nutty bean that I bought at the Hokkaido fair in Isetan. Made the above in about 20 mins. Used a tiffin carrier that my mum bought for me from Thailand. It’s really useful coz that’s how I ferry dinner home for my hubs every night from my mum’s. 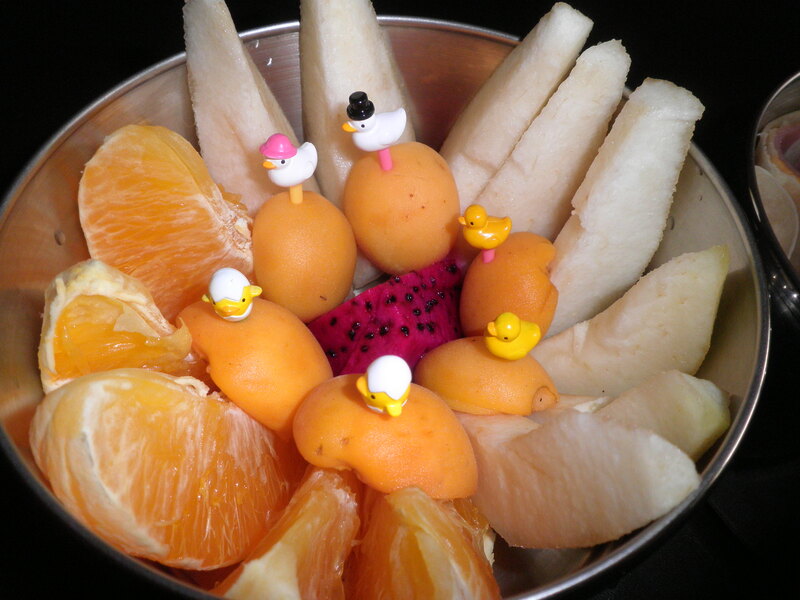 We had a fruit tier with the entire ducky family picks. 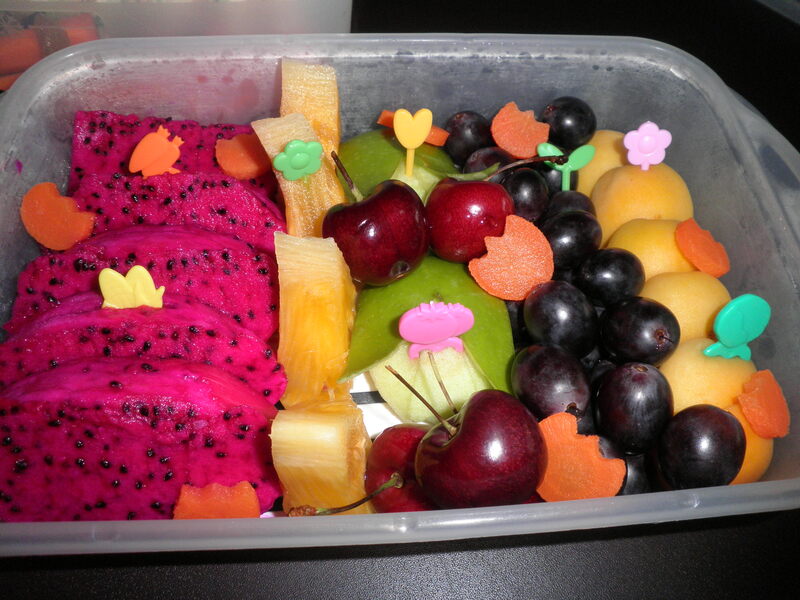 The fruits include sweet sweet south african pears, sugar apricot, little dragon fruit and oranges. My little girl only ate the pears. 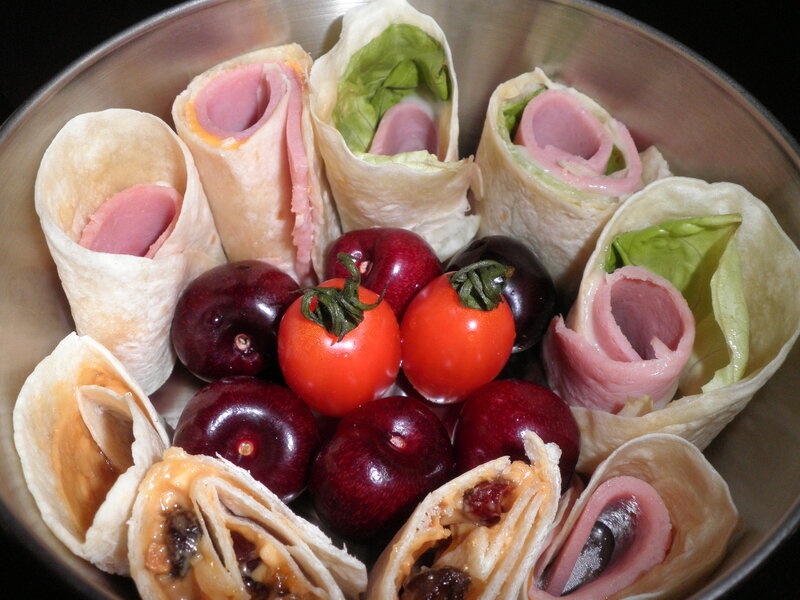 On the 2nd tier, we had ham and cheese tortilla rolls. Some had lettuce inside and some not coz again little girl don’t eat lettuce. I made a sweet tortilla too for variety. It’s made of PBJ and some dried cranberries. That was quite delicious! 😀 This picnic was less stressful as we did not have to carry so many things and drive out to the park. My little girl got to play on the slide and our neighbour joined us with her little girl too.Maybe next round will do it at the pool side but will have to check and see if it’s okay to have food near the pool. 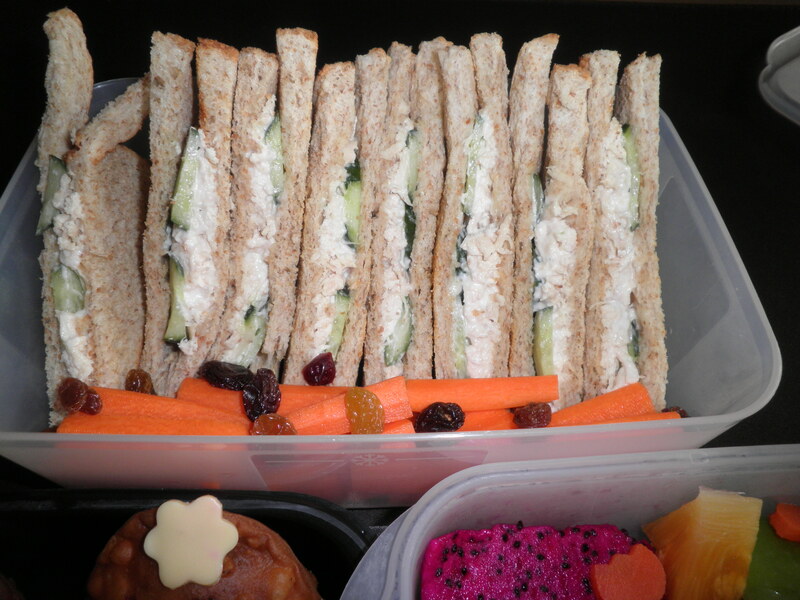 There’ll be less bento this week as my morning schedule is packed with events. But hopefully I can squeeze in time to make one before the week ends. 😉 And I’ll submit this for the picnic BOMB contest too! 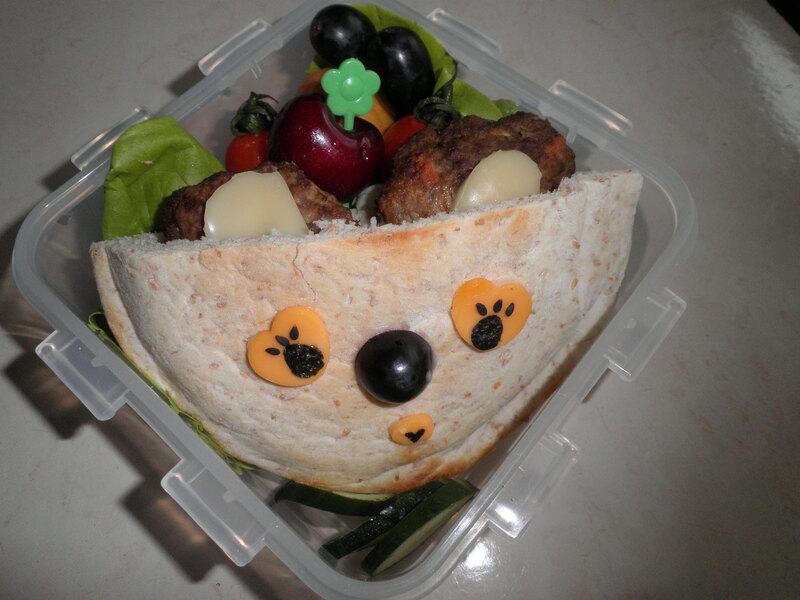 This koala is made from the burger patties that I was inspired by Sheri of Happy Little Bento (http://happylittlebento.blogspot.com/). I stuffed it into the toasted pita which had some of the leftover cheese bits from the eyes and tiny mouth, mayo and lettuce. I used a small little grape for the nose and I guess it’s the nose that made it look like a koala. The burger patties formed the ears and had did a free form cut out of cheese to make it look more like a pair of ears. 😀 Not to brag, but those patties were quite yummy.I also tried the sesame trick for eyelashes and it was so fun!! Some of it actually dropped into the box coz I only thought about making the eyelashes when I was assembling the box. Oh and I finally got the promotion letter!!! Yeah! Yeah! Can go stock up on my bento gears already!!!!! This morning I had a special request from my MIL. 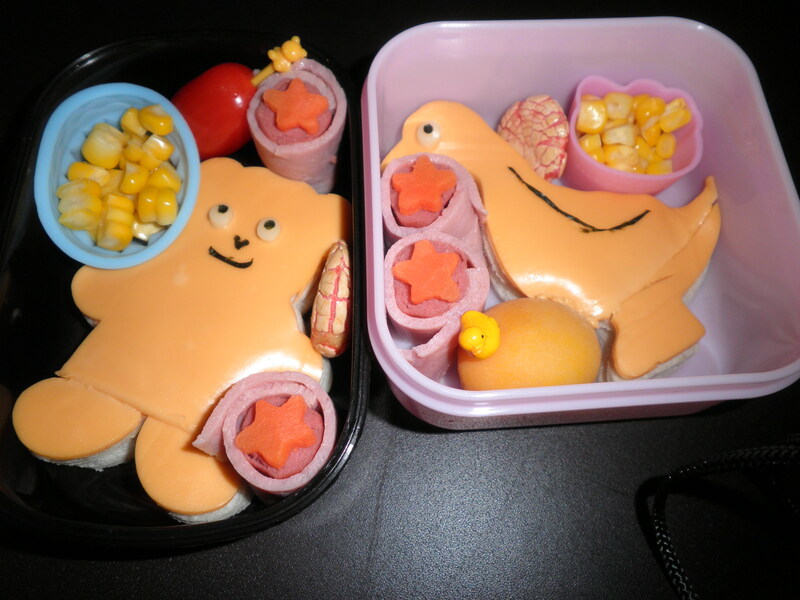 It’s her colleague’s birthday today and she asked if I could make her a cute bento to bring as a present. Of course I willingly and happily agreed to it. 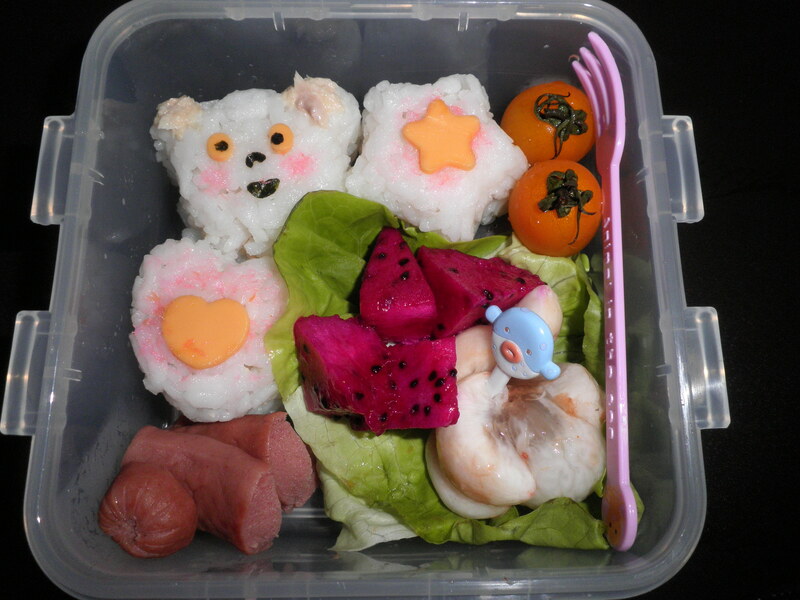 This morning’s bento was inspired by Yum-Yum Bento Box: Fresh Recipes for Adorable Lunches. (http://www.yumyumbento.com/) I made the mini piggy hamburger 😀 Of course mine was not as pretty and kawaii as the one featured in the book. Am still learning. Anyway, I made the beef patties the night before. Mixed minced beef with some garlic and carrots and pan fried them. They were delicious and this is all thanks to Sheri of Happy Little Bento (http://happylittlebento.blogspot.com/). Am really thankful to have all of these kind mistress of bento that had provided loads of guidance and inspiration in my bento adventures. Again, I hope to learn more from all of them! The picture is kind of orange-y and the details are not so clear. And yes, there are 4 boxes this morning. Made one for MIL, one for MIL’s friend, one for a colleague who had kindly requested for it and one surely for myself. 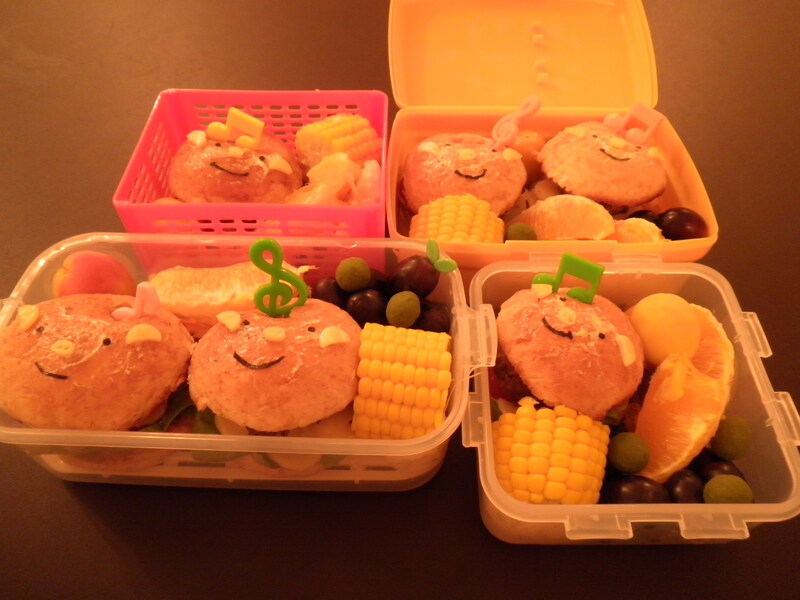 The rest of the bentos were made up of sweet corn, sugar apricot, grapes and slices of oranges. I put in a few green macha beans that I got from the Hokkaido fair at Isetan. These beans are sweet with some milky macha on the outside and crunchy on the inside. Love them! I’ve wanted to get this Hello Kitty picnic bento set for a long while but have yet to coz it’s quite expensive but told myself that if the promotion do come along end of month that will be the first thing I’ll get for myself!! So this morning’s picnic bento came in assorted boxes. This is the fruit box. The simplest mayo chicken sammies. And here’s all of them. We finished all the yummies especially those little beef and potato curry puff purses that were quite delightful and not too spicy. And for once, my little girl ate those cheese “clasps” and like it. She use to hate cheese and I don’t push her because she has a bit of issue with lactose intolerance but after this morning, no complains on tummy pain but instead she kept asking for the “clasps”!!! 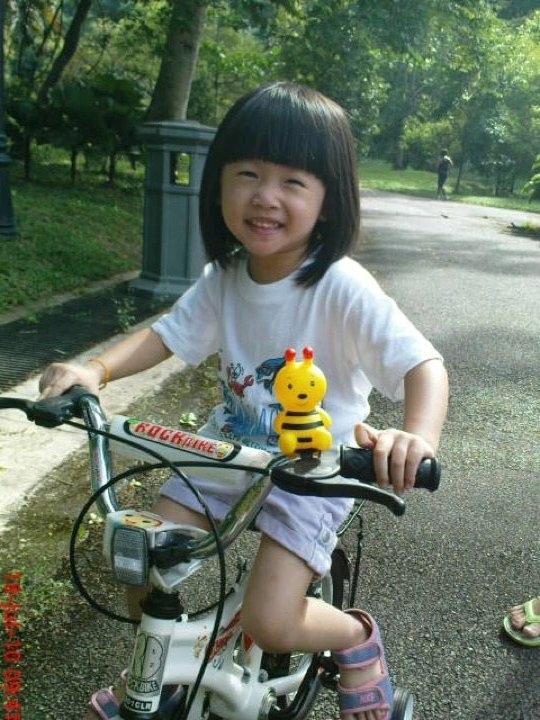 She did not succeed in learning how to cycle though.Haha! This morning I made my pyramid from dumpling and nori. The dumpling is home-made by an aunt of my hubs and its simply delicious. Its actually a symbolic food for some historical event in China but am not really sure of the real story. Only know that it’s an event celebrated every 5th month of the Lunar Calendar. Aiyah, so embarrassing. 😛 One thing for sure is that I love the time of the year when these dumplings are in abundance. It’s made of glutinous rice, shaped into a pyramid and wrapped with bamboo leaves. The fillings are different depending on the different Chinese region. My favourite are the ones with pork, salted egg yolk, beans, mushroom and chestnut. And this is what I had! Was fortunate had got this box that has a bit of space at the top when closed so that the dome of my pyramid will not be squashed! The box is actually a free gift from purchasing vitamins for my little girl. Haha! 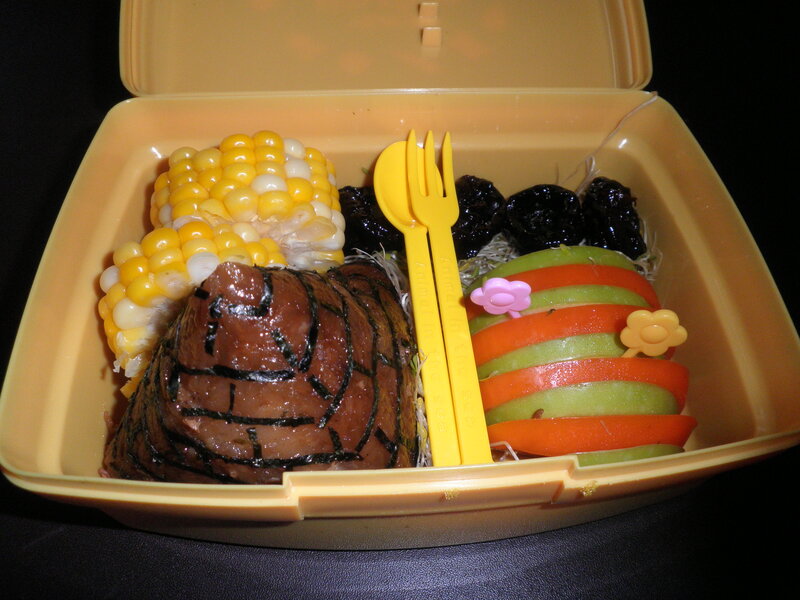 The rest of the bento are made up of slices of green apples with persimmons, prunes, alfafa and sweet corn. My pyramid didn’t last as an iconic structure as its all in my tummy now. Yum Yum! !